27 Mar Which sin is mine? 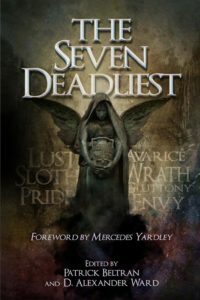 I’m absolutely thrilled to announce that THE SEVEN DEADLIEST will be released by Cutting Block Press on May 7. A collection of seven novelettes addressing the big baddies, the book includes stories by Brian Kirk, Bracken MacLeod, Richard Thomas, Rena Mason, Kasey Lansdale, John FD Taff and yours truly. I’ll share a bit more about my contribution later, but in tackling the sin of Avarice, I believe I’ve written my best story in some time.